Forums » Grassroots Motorsports » Mini van towers unite! How'd you set up your rig? I'm setting up the MPV to tow a dolly/race car. I figure I'll be towing around 3000 LBS which is what the US MPV is rated for (UK versions are between 3520 - 4840, what a surprise ). I'm installing a trans cooler and making sure the brakes are up to snuff. What hitches do you like? Anyone using a weight distributing hitch? 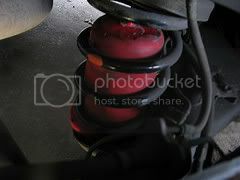 What about HD or load leveling shocks for the rear? Anyone towing with a Odessy, Sienna, Caravan, or other FWD minivan, please chime in. I thought you were saying towers, like the twin towers, and that you mistyped powers, like wonder twin powers activate, but on the next reading I figured it all out..towers, like those who tow. Nothing to ad except this glimpse into the the inner misworkings of my brain. Dolly trailers don't use load leveling hitches, as there is little to no tongue weight. So beefing the suspension in the rear also has no effect on the dolly. However, it will help keep it level when you load it up with tools and tires. For a <5000lb trailer, you should not need weight distribution or sway compensation hardware- load it RIGHT, and it will be stable. Moreso, the lighter the set up (I too tow about 3500lb). On a different package (small pickup), I did get some HD, air shocks. But that was just because the OEM stuff was garbage, and the truck sagged after towing twice. Having the air set up was awesome, as it was a spring helper- kept everything level. I've used both Class II and III hitches. Both work fine (note the lower capacity of the II). Trailer brakes are very awesome- might as well plan on installing the wiring for that, too. Here's my mini-van tow setup. I've posted it here before. Stock Ford Freestar with Econotrailer (4 wheel electric brakes) and Spridget. 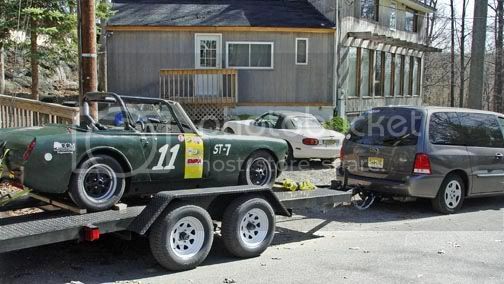 Racecar/trailer weighs roughly 3000# and I have a 3500# limit so you can't tow big vehicles. Class III hitch with no equalizer. It's perfect for my application. I usually stick to 60-65 MPH with it: it has no problem with the big hills in central PA (on Rt 80). Much prefer it to my previous Chevy C30 van. As per the Ford suggestions, I never tow in lockup. 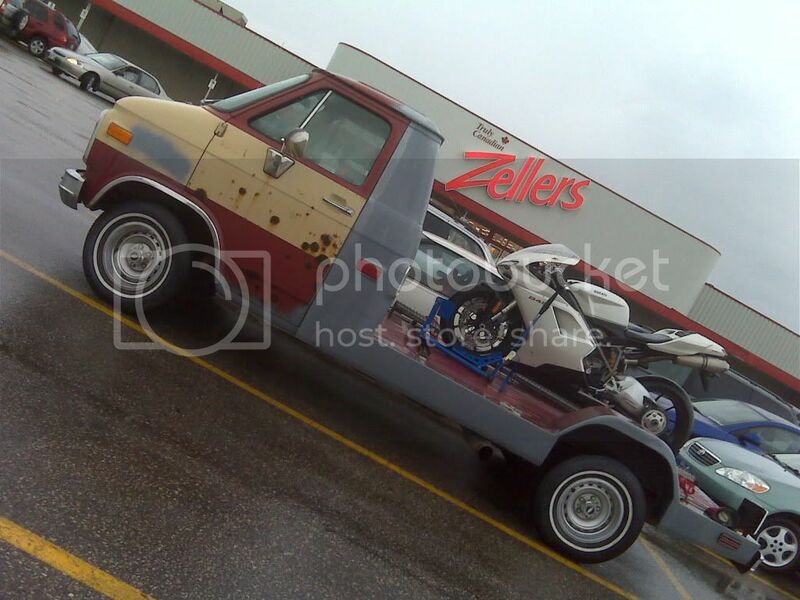 Has at least 50 pulls on it. We'll be at NJMP next week and then The Glen after that. Gets an honest 16 MPG (with a/c on most of the time ). Plus it can be used as a "normal" vehicle when not towing. I am noticing more and more mini-vans used for towing at our vintage events. I've seen two Odys used for towing plus several old Chrysler minis. Oh yeah, here's the "Car Camel" built from a Chrylser mini. Kinda neat. It was used for one of the Targa Newfoundland cars. Thanks for the pictures and posts. I'm not surprised that more folks are towing with smaller cars. You just don't need a 1 ton dually diesel to tow a small trailer/dolly with a race car. What brand hitch do you guys like? I'm confused by all the different ones that basically look the same and have the same ratings. FWIW my buddy towed my 2001 Challenge car from PA to FL and back with a stock 90s Chryco Minivan w/ the 3.0L. The racecar was a gutted Dodge Shadow (2400lbs?) on a tow dolly. No problems at all. The towed car was hardly noticed back there when out on the highway. Not sure which hitch he had on the van, but i can't imagine there'd be any significant difference between brands. When I towed with my '97 3.8L Grand Caravan, I had a Curt class 3 hitch and the rear load leveling suspension. No trailer brakes. The only problem I had is when I pulled a car home when it was snowing. That was an interesting experience. 2004 Sienna here - towing a 2100# VW Golf. 3500# tow capacity on the van. The U-Haul dollies weight around 700# IIRC. Tows fine at 65 mph with a tow dolly, just be sure and allow for looooonger stopping distances. If the dollies had the capacity for trailer brakes, I'd definitely go that route. Class III hitch, purchased online from www.etrailer.com . Capacity and installation of all the Class IIIs they stocked was basically the same, I bought based on price (about $220, $270ish with the wiring kit). Also bought a set of air assist bags ($75 shipped) for the rear which helps to level and firm up the ride and gave a little more stability (there is some weight on the tongue, not much, but some) from Amazon ( http://www.amazon.com/LIFT-60732-1000-Air-Spring/dp/B000CFS028/ref=sr_1_1?ie=UTF8&s=automotive&qid=1252764195&sr=8-1 ) . Installation of the hitch, wiring and airbags are within the reach of a basic home mechanic, the instructions were comprehensive. The tow ball and the ball mount I purchased at the U-Haul place, since I wanted to get the length and ride height correct for the dolly. There are different ball sizes, so make sure you get the correct one. Honestly, it tows better than I thought it would, gets 18mpg on the flats at 65mph (I keep it out of overdrive, not sure if that's necessary, but...). It also has the advantage of being able to fold forward / drop the rear seats into the floor to give a flat sleeping - I can camp comfortably at the track AND watch Cinderella on the DVD player! I'd recommend frequent ATF changes, towing can get a transmission pretty hot. The Siennas of this era came standard with a "towing package" (larger trans cooler and fan) - if you don't have one, I'd recommend that also. I do dream wistfully of something with a little more capacity, but at this stage it'll be a few years.